They'll have to secure their account and confirm their location. Facebook is introducing a new verification process intended to ensure those who run Pages with a significant following are who they say they are. Starting with Pages that have a large US audience, Page managers will have to complete an authorization process that will require them to confirm their primary country location and secure their account with two-factor authentication. Those required to take this step will receive a notice at the top of their News Feed and they won't be able to post on the Page in question until the authorization process is completed. Facebook says it's taking these steps to make it "harder for people to administer a Page using a fake or compromised account." For those that visit a Page, they'll soon be able to see more information about its history and who runs it. 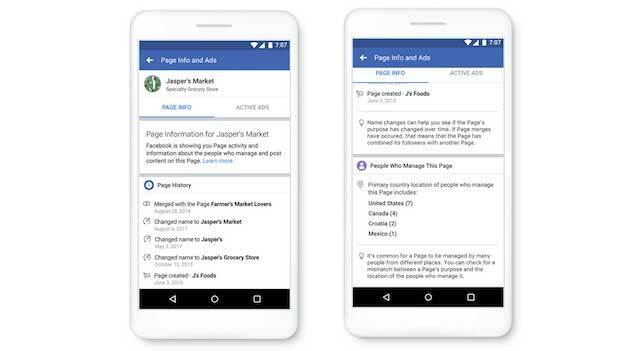 The primary country location of Page managers will be listed in the Page Info section as will a Page's history. So, for example, if the Page name has changed or if it has merged with another Page, you'll be able to see a log of those updates. These changes are part of Facebook's transparency efforts. Earlier this year, it began requiring political ads to disclose who paid for them -- a process that has had a few issues of its own. Last month, the social media giant said it removed a number of fake Pages and accounts that appeared to be involved in attempts to influence midterm elections in the US. Facebook says enforcement of these new policies will begin later this month and similar features will be introduced to Instagram accounts with large audiences in the coming weeks.